Here is an example of a great business that we have listed. If you have got a great business that you are looking to sell for a fantastic price, we are the brokers to sell if for you. If other brokers have failed to deliver, come and talk to us and see what we can do for you. We offer obligation free consultations, so why not take then next step? With a low upfront fee and nothing to pay until sold, why not shake the tree and see what falls out? 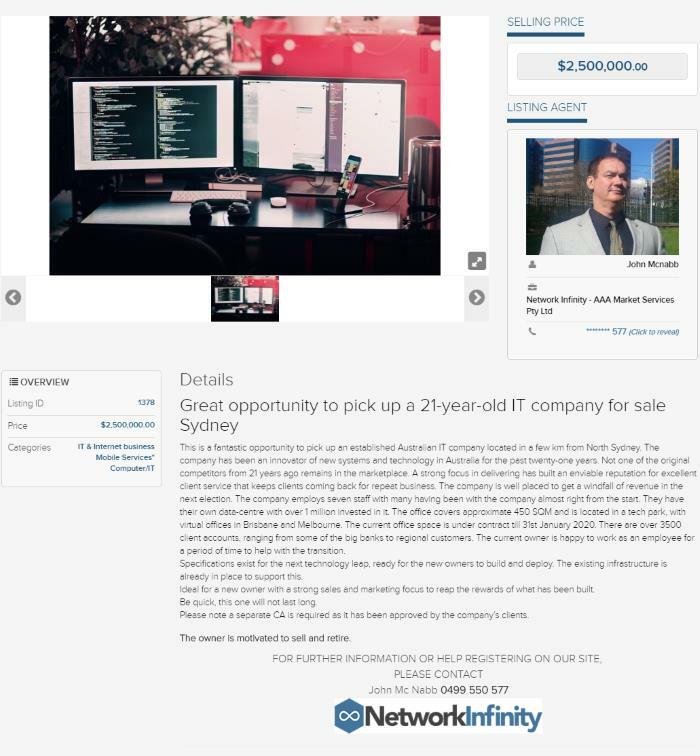 This is a fantastic opportunity to pick up an established Australian IT company located in a few km from North Sydney. The company has been an innovator of new systems and technology in Australia for the past twenty-one years. Not one of the original competitors from 21 years ago remains in the marketplace. A strong focus in delivering has built an enviable reputation for excellent client service that keeps clients coming back for repeat business. The company is well placed to get a windfall of revenue in the next election. The company employs seven staff with many having been with the company almost right from the start. They have their own data-centre with over 1 million invested in it. The office covers approximate 450 SQM and is located in a tech park, with virtual offices in Brisbane and Melbourne. The current office space is under contract till 31st January 2020. There are over 3500 client accounts, ranging from some of the big banks to regional customers. The current owner is happy to work as an employee for a period of time to help with the transition. Specifications exist for the next technology leap, ready for the new owners to build and deploy. The existing infrastructure is already in place to support this. Ideal for a new owner with a strong sales and marketing focus to reap the rewards of what has been built. Be quick, this one will not last long. Please note a separate CA is required as it has been approved by the company’s clients. The owner is motivated to sell and retire.